Ich habe diese wunderschöne Libelle, die Mittelstücke bei den Blumen (spacer) und die Blumen bei Embellishments.de gekauft. Susanne hat ein wunderbares Sortiment! Paper: SU kraft cardstock, design paper "Parisian Summer"
Wow... was für eine wunderschöne Karte. This is so beautiful and soft! Love it. 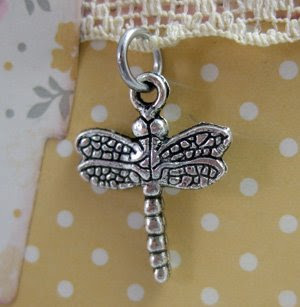 Fab creation, great embellishments, love the charm! Die Karte ist wunderschön - wie alle Deine Karten !! OH...your card is splendid, Katharina!!! I adore the papers and colours. 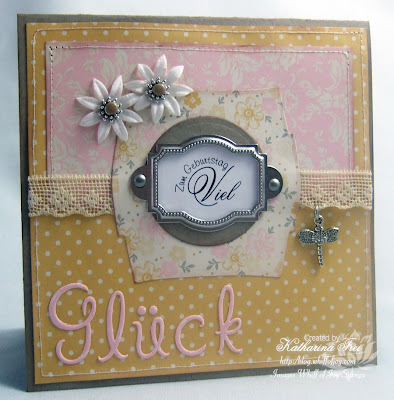 Thats a beautiful card, love the vintage effect and the little charm is lovely. very pretty. love that charm! Katharina what a beautiful birthday card! It's so elegant and pretty! Great work! Wishing you a wonderful weekend! Very sweet and feminine! It makes me think of the cozy linens my grandmother had in her bedroom. She would have loved this! Das ist so eine traumhaft schöne karte - wow, wow, wow! Eine wunderschöne Karte, die sehr edel geworden ist. So eine hätte ich auch gerne als Vorrat zur Hand! Es freut mich sehr, dass du die Sachen aus meinem Shop so gut einzusetzen weißt! It is beautiful Katharina, I love the sentiment and it looks great in the hardware! I too am always short of birthday cards, people always expect me to have a large collection of them but I have trouble keeping up with how many I need! Stunning card and I love the senitments that you have designed!